My Little Love Noah took me to see Tyne Daly in her cabaret at Feinstein's on Friday night. 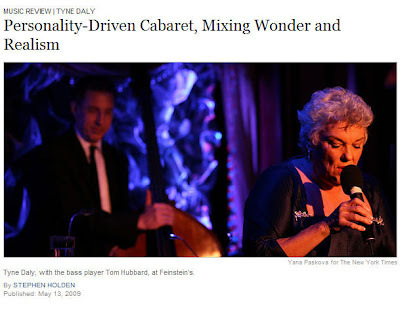 Stephen Holden at the New York Times beautifully reviewed her act. Tyne played Rose in the 1989 revival of Gypsy and the won the Tony for that performance. I am always intrigued to see a former Mama Rose perform because she will no doubt be formidable and special. However, of every Gypsy recording I have from around the world, Tyne's is not looping in my playlist. I just didn't like the voice. I have heard from people who saw her that she was magnificent in the role. Fair enough. I know she's a great actress because I've seen her on television. Noah convinced me that she's not somebody you see because of the voice, but because of everything else. After seeing her live in cabaret, he's definitely right, but I have to say that now I do want to hear her voice. At times it was unexpectantly gorgeous, dripping with tenderness and emotion - not the kind of voice that evokes The Beautiful Voice - but the one that makes you feel everything the song is saying, whether its joy or heartbreak. In this her first cabaret, she appeared comfortable and affable with the intimate audience. It's what I love about hearing a performer in a small room - it's like being in a living room and somebody is just telling stories in song. Tyne seemed to be a master at this. Number one, she is an actress, but even though she was acting each song, it was as if she was sharing her inner self with us as well. It was touching to see her eyes well up with tears that never quite spilled. That was not the case for me. It was a two or three tissue evening for me, despite every attempt to hold back the tears. Tyne's renditions of Jule Styne's Killing Time, a first listen for me, and Richard Rodney Bennett's Not Exactly Paris just about did me in. Her final numbers from Ballroom, The Job Application and Fifty Percent, really did me in. It wasn't all tears. There were a LOT of laughs. She brought out a couple of very old songs that were probably standards from Broadway around 100 years ago. She also sang a great song called Crayola Doesn't Make a Color for Your Eyes. The songwriter Kristin Andreassen and her writing partner were in the house too. The absolute most fun song of the evening was Captain Hook’s Waltz from Peter Pan, complete with dialogue. She got into the character of Captain Hook, a role she confessed that she always wanted to play, and encouraged audience participation. It was an absolute blast. I hope she'll be back at Feinstein's soon. Even more so, I hope she'll be back on Broadway soon. Wouldn't a revival of Peter Pan with some unusual casting be fun?! PS Tyne Daly appeared on the Leonard Lopate Show on WNYC on May 11th. Listen here to this great interview.